By Alan Menken. Arranged by MJ Summer at enjoypianomusic.com. Musicals, Movies, Method, General Instructional, Pop. 7 pages. Published by EnjoyPianoMusic.com, LLC (H0.82759-66212). 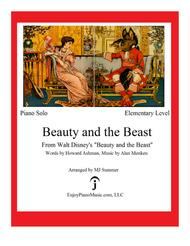 Appealing to both children and adults at the elementary level, this Disney song was arranged with sounding pedagogical principles. It supports piano teachers' teaching, and it keeps piano students engaged.